A watercolor made on antique ledger paper (1880’s) by Lakota artist Joe Pulliam. The paint only partially masks the writing on the ledger; the writing is still evident on close inspection (see the second and third images). 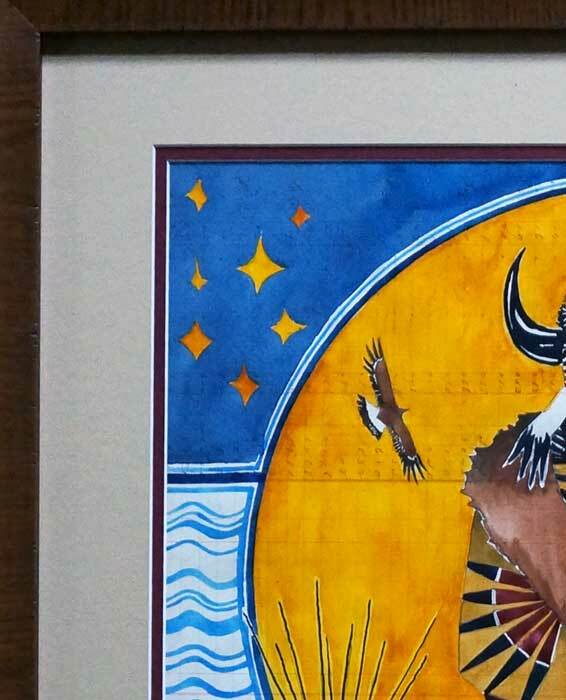 Pulliam’s work is in the permanent collection of the National Museum of the American Indian and is featured in Unbound: Narrative Art of the Plains at the George Gustav Heye Center from March 12 through December 4, 2016. “Leaders of dream societies were sacred men, spiritual interpreters and advisers. Dream societies had special significance for all people. For example, the Buffalo Dreamers were consulted when it was time for the camp to look for buffalo. The Buffalo songs were sung, special prayers offered, and a Buffalo Dance performed by the society members with special head dresses and other ceremonial components. 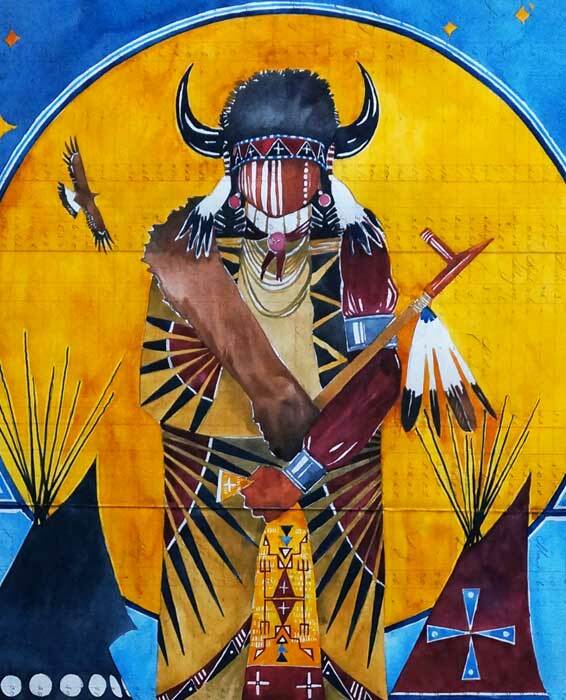 The Buffalo Society is known as Tatanka Okolakice. 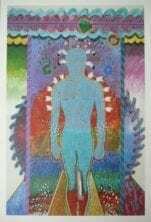 Visible 16 ¾ x 22 ¼’; framed 23 ½” x 29”. The painting is double matted and framed in a dark wood. A watercolor made on antique ledger paper (1880’s) by Lakota artist Joe Pulliam. The paint only partially masks the writing on the ledger; the writing is still evident on close inspection (see the third image). 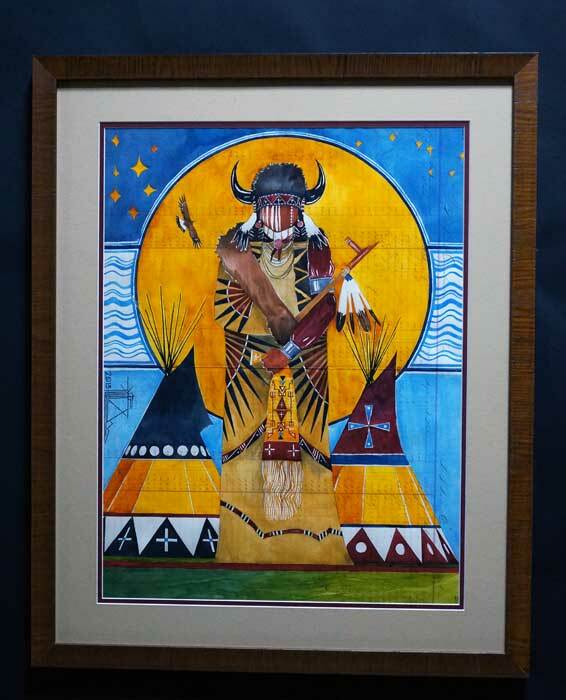 Pulliam’s work is in the permanent collection of the National Museum of the American Indian and is featured in Unbound: Narrative Art of the Plains at the George Gustav Heye Center from March 12 through December 4, 2016.